Meiosis is a specialized cell division critical for gamete production in the sexual reproduction of eukaryotes. It ensures genome integrity and generates genetic variability as well. The Rec8-like cohesin is a cohesion protein essential for orderly chromosome segregation in meiotic cell division. The Rec8-like genes and cohesins have been cloned and characterized in diploid models, but not in polyploids. The present study aimed to clone the homoeologous genes (homoeoalleles) for Rec8-like cohesin in polyploid wheat, an important food crop for humans, and to characterize their structure and function under a polyploid condition. We cloned two Rec8-like homoeoalleles from tetraploid wheat (TtRec8-A1 and TtRec8-B1) and one from hexaploid wheat (TaRec8-D1), and performed expression and functional analyses of the homoeoalleles. Also, we identified other two Rec8 homoeoalleles in hexaploid wheat (TaRec8-A1 and TaRec8-B1) and the one in Aegilops tauschii (AetRec8-D1) by referencing the DNA sequences of the Rec8 homoeoalleles cloned in this study. The coding DNA sequences (CDS) of these six Rec8 homoeoalleles are all 1,827 bp in length, encoding 608 amino acids. They differed from each other primarily in introns although single nucleotide polymorphisms were detected in CDS. Substantial difference was observed between the homoeoalleles from the subgenome B (TtRec8-B1 and TaRec8-B1) and those from the subgenomes A and D (TtRec8-A1, TaRec8-A1, and TaRec8-D1). TtRec8-A1 expressed dominantly over TtRec8-B1, but comparably to TaRec8-D1, in polyploid wheat. In addition, we developed the antibody against wheat Rec8 and used the antibody to detect Rec8 cohesin in the Western blotting and subcellular localization analyses. The Rec8 homoeoalleles from the subgenomes A and D are transcriptionally more active than the one from the subgenome B in polyploid wheat. The structural variation and differential expression of the Rec8 homoeoalleles indicate a unique cross-genome coordination of the homoeologous genes in polyploid wheat, and imply the distinction of the wheat subgenome B from the subgenomes A and D in the origin and evolution. Meiosis is a specialized cell division with one round of DNA/chromosome replication and two successive divisions of the nucleus, producing haploid gametes (i.e. egg and sperms) for sexual reproduction. The first meiotic division (meiosis I) allows maternal and paternal homologous chromosomes to pair, recombine, and segregate, and consequently reduces chromosome number by half. The second meiotic division (meiosis II) is similar to mitosis, allowing sister chromatids to segregate. The outcome of meiosis is four haploid daughter cells that eventually develop into gametes [1, 2]. Fertilization of the male and female gametes restores chromosomes to the parental ploidy level in the offspring. Therefore, meiosis ensures genetic integrity and generates genetic variability as well. It governs the transmission of genetic materials and provides the cytological basis of heredity. Meiotic chromosome segregation is coordinated primarily by the orientation of sister kinetochores where spindle microtubules attach on a chromosome, and the cohesion protein complex called cohesins. Cohesins glue sister chromatids together prior to chromosome segregation at meiosis I and II . A variety of meiotic genes/proteins have been identified as essential for proper chromosome cohesion and kinetochore orientation in meiosis . Among those, Rec8 cohesin, which is highly conserved in eukaryotes, plays a central role in chromosome cohesion and sister kinetochore orientation at meiosis I [5–7]. Several other meiotic proteins have been found to interact with Rec8, and coordinate the function of Rec8 as a meiotic cohesin and a regulator for kinetochore orientation [8–10]. The Rec8 cohesin appears at the pre-meiotic S phase, and associates with sister chromatids in the centromeric region as well as along chromatid arms. Prior to anaphase of meiosis I, Rec8 on chromatid arms is cleaved by separase to facilitate resolution of chiasmata and segregation of paired homologues. However, Rec8 in the centromeric region persists till anaphase II. The centromeric Rec8 is cleaved by separase to ensure segregation of sister chromatids prior to anaphase II [9, 11]. Rec8-like genes have been cloned and characterized in diploid plant models, including Arabidopsis (Syn1) [12–14], maize (afd1) , and rice (OsRad21–4) . However, knowledge of the Rec8-like gene and cohesin is very limited in polyploids. Wheat, including hexaploid wheat (Triticum aestivum L., 2n = 6× = 42, genome AABBDD) and tetraploid wheat (T. turgidum L. ssp. durum, 2n = 4× = 28, genome AABB), contains genetically related subgenomes (A, B, and D). It has large chromosomes and a variety of cytogenetic stocks, providing advantages for direct visualization and characterization of chromosomes and subcellular structures. However, its large (~ 16 Gb) and complex allopolyploid genome make gene cloning and functional analyses a challenging task. In this study, we aimed to clone the subgenome-specific homoeologous genes (homoeoalleles) for the Rec8-like cohesin in polyploid wheat, and to characterize their gene structure and function at the molecular and subcellular levels using an integrative cytogenetic and genomic approach. The Rec8-like cohesin is highly conserved in the DNA/protein sequences and subcellular function across eukaryotes [5, 6, 15, 17, 18]. Rice (Oryza sativa) is a model species closely related to wheat [19–21]. We used the amino acid sequence (608 AA) of rice Rad21/Rec8-like protein Os05g0580500 (GenBank accession BAF18340.1) as BLASTp query to search against the wheat EST database at the GrainGenes website . An 808-bp wheat expressed sequence tag (EST) (GenBank accession BQ744508) was found to have 80% identity with the query at an E-value cutoff of e− 110. This EST was annotated as part of the candidate gene for the Rec8-like cohesin in wheat. Gene-specific primers were designed based on the DNA sequences in the conserved regions of the candidate EST. Reverse transcription polymerase chain reaction (RT-PCR) was performed with the cDNAs of Langdon (LDN) durum wheat anthers at early prophase I through pachytene stages in which the Rec8-like genes were highly expressed according to the findings in model species [9, 11]. The amplicons of RT-PCR were sequenced and analyzed, and then used to design new gene-specific primers for rapid amplification of cDNA ends (RACE). The cDNA assemblies of the candidate gene were obtained after several rounds of RACE in LDN. Since LDN is an allotetraploid with two homoeologous subgenomes (A and B), it generally contains two homoeoalleles with high sequence similarities for a gene [23–27]. To eliminate assembling errors of the RACE segments, the gene-specific primers for the final round of RACE at 5′ and 3′ ends, which spanned the start and stop codons, were used to amplify the full-length coding DNA sequence (CDS) of the candidate homoeologous genes for the Rec8-like cohesin in LDN. Only one CDS, instead of two, was recovered and cloned from LDN. It was 1,827 bp in length encoding 608 amino acids with a predicted molecular weight of 67.6 kDa. The alignments of the predicted protein for the candidate gene with the Rec8 orthologues from other eukaryotes revealed high levels of amino acid sequence similarity, especially with the monocots Brachypodium distachyon, rice, and maize (67–80%) (Additional file 1: Table S2). In addition, the predicted protein of the candidate gene contains two conserved domains of Rad21/Rec8 cohesin, i.e. pfam04825 at N-terminus and pfam04824 at C-terminus. Also, the predicted protein has a serine-rich region that is conserved among the Rec8 cohesins in plants. The serine-rich region is essential for the cohesin to interact with other proteins in the meiotic network. Furthermore, there are two potential proteolytic cleavage sites (PEST motifs) characterized as signals for rapid protein degradation in the predicted protein molecule. These results supported the candidate gene as a Rec8-like homologue in tetraploid wheat (T. turgidum), designated TtRec8 (Additional file 1: Figure S1). A significantly higher level of TtRec8 transcripts was detected in the anthers at early meiotic prophase I than in roots and leaves of LDN by real-time PCR. The transcription level of TtRec8 was the highest at interphase through early prophase I, and peaked at pachytene stage. After that, TtRec8 transcripts continuously declined to a relative level of 3.77–4.14% at the end of meiosis I and later stages (Fig. 1a). The relative transcription levels of TtRec8 in roots and leaves were only about 9.04% and 0.02% of that in the anthers at interphase, respectively. 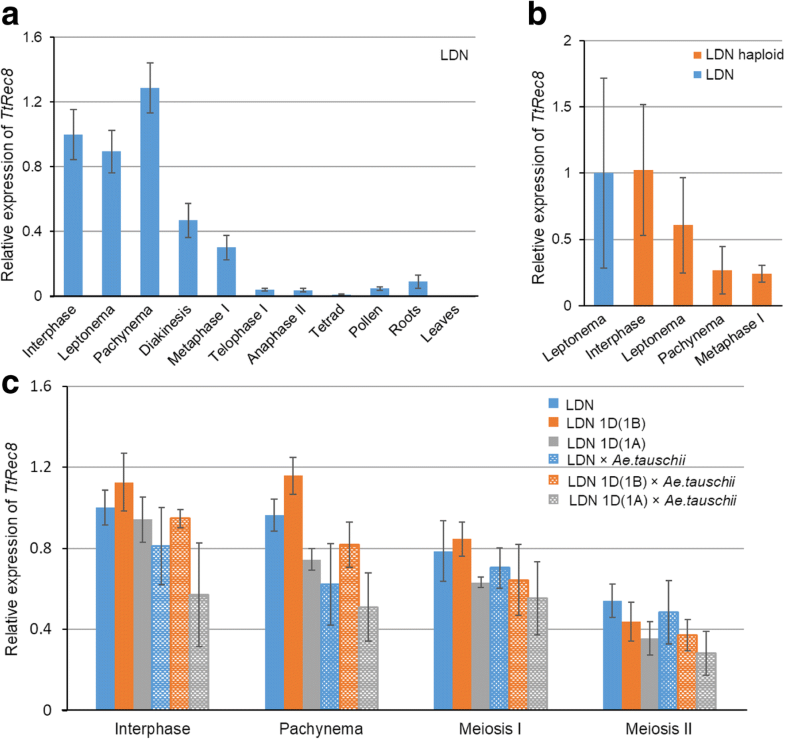 TtRec8 in haploid LDN exhibited an expression pattern similar to LDN, but its overall expression levels were relatively lower than LDN (Fig. 1b). Thus, TtRec8 showed an expression profile similar to the Rec8-like genes in model species [9, 11], further supporting TtRec8 as a Rec8-like homologue in tetraploid wheat. The polyclonal antibody against TtRec8 was produced to probe TtRec8 protein in Western blotting and to localize TtRec8 on meiotic chromosomes. Immunoprecipitation was performed to verify the specificity of the anti-TtRec8 antibody. After anti-Rec8 antibody was incubated with the total protein extract from the anthers undergoing meiosis, a protein with a molecular weight a little over 60 kDa was immunoprecipitated. This molecular weight matched the predicted molecular weight 67.6 kDa of TtRec8. This protein was not present in the supernatant after immunoprecipitation. In addition, no precipitation was observed when anti-TtRec8 antibody was not added to the protein extract (Fig. 2, top). 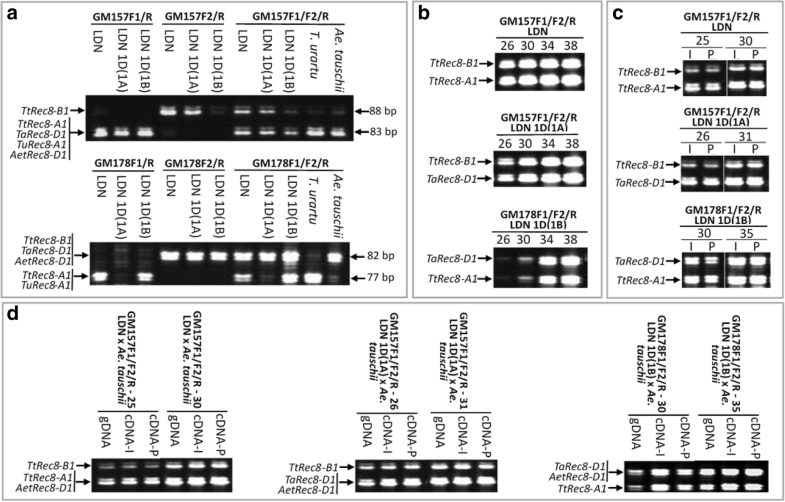 These results validated the specificity of the antibody for TtRec8 protein in tetraploid wheat. Western blotting detected the highest level of TtRec8 protein in the anthers at early prophase I. Moderate amounts of TtRec8 were detected in the anther samples at later meiotic stages, indicating partial retaining of TtRec8 cohesin after early prophase I. The TtRec8 protein level at early prophase I was higher than those at later meiotic stages, but the difference did not seem to be significant (Fig. 2, bottom). This might result from the meiotically unsynchronized meiocytes present in some of the anthers sampled for the Western blotting analysis. The anther samples we collected for each of the meiotic stages occasionally contained some off-type meiocytes, i.e. those at a meiotic stage earlier or later than the targeted stage. The off-type meiocytes could lower the TtRec8 protein level in the anther sample at early prophase I in which TtRec8 has the highest expression. On the other hand, the anther samples at later meiotic stages occasionally contained the meiocytes at early prophase I, leading to an elevated TtRec8 protein level. Thus, the off-type meiocytes narrowed down the overall difference in the TtRec8 protein levels between the anther sample at early prophase I and those at the later meiotic stages. We performed the in situ immunolocalization assay to localize endogenous TtRec8 protein on the meiotic chromosomes. TtRec8 protein was clearly detected along the entire chromosomes from early leptonema through pachynema in meiosis I (Fig. 3, a1-a3 and b1-b3). After pachynema, TtRec8 was almost undetectable by in situ immunolocalization (Fig. 3, c1-j3). Apparently, the majority of the TtRec8 protein dissociated from chromosomes after pachynema. 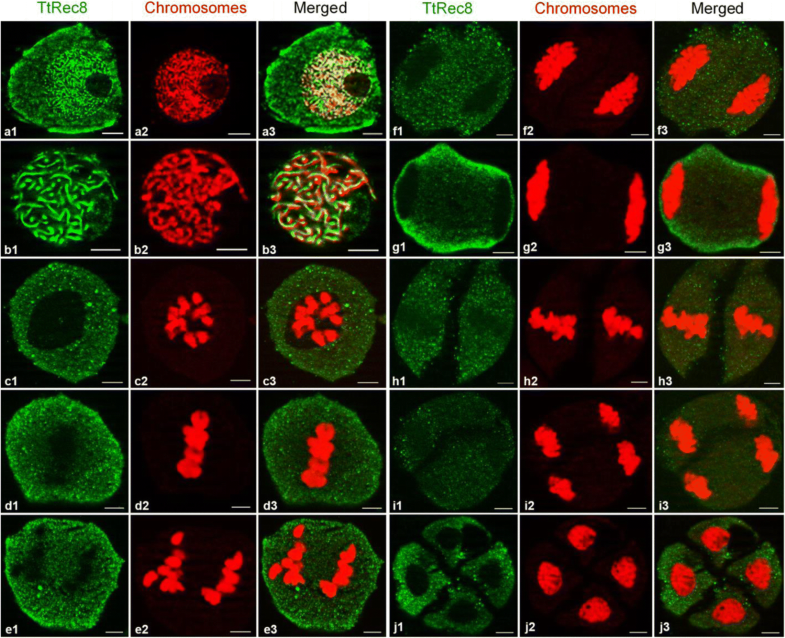 TtRec8 protein was not detected on mitotic chromosomes in the somatic cells of anthers that underwent mitosis, indicating TtRec8 is meiosis-specific (Fig. 4). The kinetics of TtRec8 through the meiotic processes in LDN was very similar to the Rec8 cohesins in the model species [9, 11]. These are strong evidence validating the identity of TtRec8 as a Rec8-like homologue in tetraploid wheat. 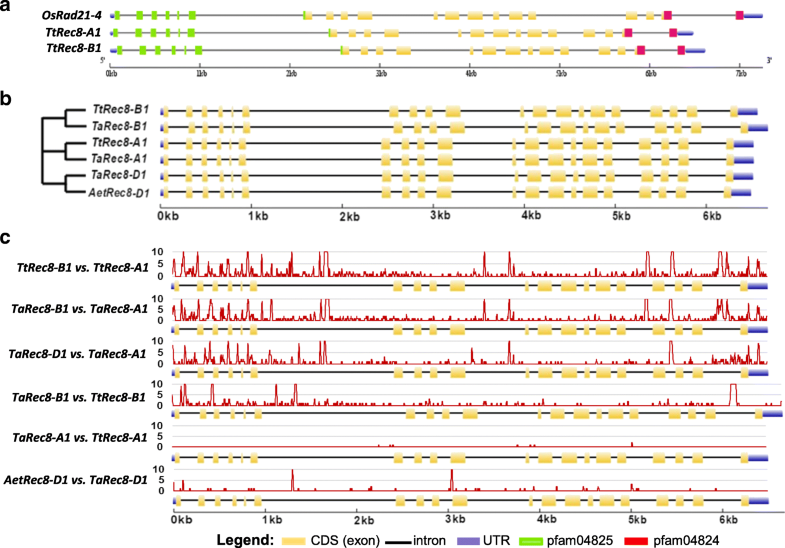 Screening of the LDN bacterial artificial chromosome (BAC) library with the cDNA probes of TtRec8 identified six BAC clones containing TtRec8 (Additional file 1: Figure S2A). Fingerprinting with HindIII and cleaved amplified polymorphic sequence (CAPS) analysis categorized these six BAC clones into two groups (Additional file 1: Figure S2B and 2C). Apparently, these two groups of the BAC clones harbored different homoeoalleles of TtRec8. The two TtRec8 homoeoalleles in LDN mapped to chromosome 1A and 1B using Chinese Spring (CS) wheat nulli-tetrasomic and LDN disomic substitution (DS) lines (Fig. 5), designated TtRec8-A1 and TtRec8-B1, respectively. In addition, chromosome 1D of CS wheat was found to contain another homoeoallele of the Rec8 gene (Fig. 5), designated TaRec8-D1. The rice Rec8-like gene OsRad21–4 and Brachypodium gene encoding sister chromatid cohesion 1 protein 1-like protein were assigned to the long arms of chromosome 5 and chromosome 2, respectively. Both chromosomes are collinear with wheat chromosomes in homoeologous group 1, i.e. 1A, 1B, and 1D [16, 28]. These results further confirm the identity of the wheat homoeoalleles as the Rec8-like genes in polyploid wheat. A 40-kb genomic DNA fragment containing TtRec8-A1 was sub-cloned into a cosmid vector for sequencing. A 6.5 kb DNA segment harboring TtRec8-A1 was completely sequenced. A similar approach was used to isolate the genomic sequence of the homoeoallele TtRec8-B1 from the BAC clone. A genomic region of 6.6 kb harboring TtRec8-B1 was completely sequenced. DNA sequence analysis indicated that the initially cloned cDNA was for the homoeoallele TtRec8-A1 located on chromosome 1A. We cloned cDNA of the homoeoallele TtRec8-A1 located on chromosome 1A from LDN, but not TtRec8-B1 on chromosome 1B in the initial cloning experiment. Thus, we attempted to clone cDNA of TtRec8-B1 from the substitution line LDN 1D(1A), where LDN chromosome 1A was replaced by CS chromosome 1D. Meanwhile, the LDN substitution lines LDN 1D(1A) and LDN 1D(1B), where CS chromosome 1D respectively replaced LDN chromosome 1A and 1B, were used to clone cDNA of the homoeoallele TaRec8-D1 located on CS chromosome 1D. We found that the cDNA primer pair GM067F/GM065R spans the start and stop codons of all three homoeoalleles (TtRec8-A1, TtRec8-B1, and TaRec8-D1) according to their genomic DNA and TtRec8-A1 cDNA sequences (Additional file 1: Table S1). Therefore, GM067F/GM065R was used to amplify cDNAs of the three homoeoalleles from the cDNA pools prepared from the meiotic anthers at early prophase I of LDN 1D(1B) and LDN 1D(1A), respectively. The amplicons were cloned and sequenced. 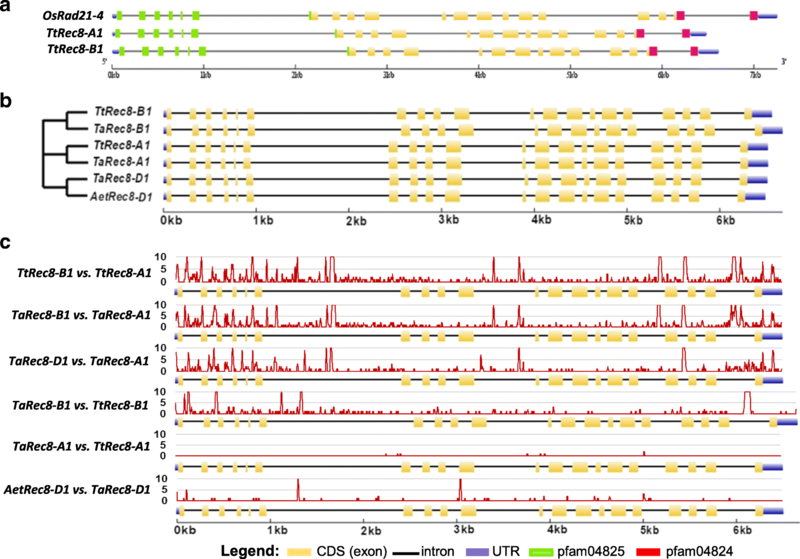 Sequence analysis indicated that the amplicons obtained from LDN 1D(1B) were the cDNA mixture of TtRec8-A1 and TaRec8-D1, and amplicons from LDN 1D(1A) were the cDNA mixture of TtRec8-B1 and TaRec8-D1. Comparative analysis identified the full-length cDNAs of TaRec8-D1 and TtRec8-B1. They have the same length of 1,827 bp encoding 608 amino acids as TtRec8-A1. The cDNAs of TtRec8-A1, TtRec8-B1, and TaRec8-D1 differed from each other at 52 SNP loci (Additional file 1: Figure S3). Alignment of the genomic DNA sequences with the CDS of TtRec8 indicates that both TtRec8-A1 and TtRec8-B1 contain 20 exons and 19 introns. The largest exon has 268 bp and the smallest 20 bp in length. The largest intron has 1,491 bp (between exon 6 and 7) and the smallest is 71 bp (between exon 15 and 16) in length. Interestingly, we found that TtRec8 and the rice Rec8-like gene OsRad21–4 share extremely high similarities in the number, size, and distribution of exons/introns despite a slight difference in length of the genomic DNA sequences (Fig. 6a). Thus, the Rec8-like gene is highly conserved in rice and wheat. The genomic DNA sequence of LDN TtRec8-A1 showed high homology (99.9% nucleotide sequence similarity in 6.5 kb region) with a CS genomic DNA segment assigned to the long arm of chromosome 1A in the International Wheat Genome Sequencing Consortium (IWGSC) CS RefSeq v1.0 assembly (TGACv1_scaffold_000516_1AL) , indicating the location of TtRec8 on the long arm of the group 1 chromosomes (i.e. chromosomes 1A and 1B). In addition, we characterized the Rec8 homoeoalleles on chromosomes 1A, 1B, and 1D of hexaploid wheat (T. aestivum) (TaRec8-A1, TaRec8-B1, and TaRec8-D1) and the one on chromosome 1D of Ae. tauschii (AetRec8-D1). Genomic DNA sequences of TaRec8-A1 and TaRec8-B1 were extracted from the IWGSC CS RefSeq v1.0 assembly by BLASTn with the genomic DNA sequences of TtRec8-A1 and TtRec8-B1 as queries . Partial cDNA sequences of TaRec8-A1 and TaRec8-B1 (~ 1.6 kb at 3′ end) were identified from the Hexaploid Wheat Transcriptome Database by BLASTn with the cDNA sequences of TtRec8-A1 and TtRec8-B1 as queries [30, 31]. Remaining 5’ cDNA sequences for TaRec8-A1 (225 bp) and TaRec8-B1 (192 bp) were deduced according to the splicing patterns of the corresponding regions in TtRec8-A1 and TtRec8-B1. The genomic DNA sequence of TaRec8-D1 was extracted from the IWGSC CS RefSeq v1.0 assembly by BLASTn with TaRec8-D1 cDNA sequence as query . The genomic DNA sequence of AetRec8-D1 was obtained from the Ae. tauschii reference genome sequence by BLASTn with the genomic DNA sequence of TaRec8-D1 as query . AetRec8-D1 shares over 99% similarity with TaRec8-D1 in the genomic DNA sequence. Thus, the cDNA sequence of TaRec8-D1 was used in the gene structural analysis for AetRec8-D1. Phylogenetic analysis placed the Rec8 homoeoalleles on chromosomes 1A, 1B, and 1D of wheat and the one in Ae. tauschii into three distinct clusters (Fig. 6b). Significant differences were observed between the homoeoalleles from different subgenomes, i.e. TtRec8-B1 vs. TtRec8-A1, TaRec8-B1 vs. TaRec8-A1, and TaRec8-D1 vs. TaRec8-A1 (Fig. 6c). However, we found that the cDNA sequences of TaRec8-A1 and TtRec8-A1 were identical even though their genomic DNA sequences differed at single nucleotide positions in several introns. TaRec8-D1 was slightly different from AetRec8-D1 in the DNA sequences. In contrast, TaRec8-B1 was quite different from TtRec8-B1 in the DNA sequences of both introns and exons. Overall, the Rec8 homoeoalleles from different subgenomes have a greater variation in DNA sequences than the homoalleles within a subgenome in wheat. The protein sequences encoded by TtRec8-B1, TtRec8-A1, and TaRec8-D1 were predicted based on the CDS cloned in this study. They all contain the conserved domains of the Rec8 cohesin (pfam04825 and pfam04824), the serine-rich region conserved in plant cohesins, and the potential PEST motifs present in the cohesion proteins (Additional file 1: Figure S4). Alignment of their protein sequences identified 23 polymorphic amino acid positions. Out of these 23 amino acid positions, 17 were polymorphic between TtRec8-B1 and TtRec8-A1/TaRec8-D1 and 6 polymorphic between TtRec8-A1 and TtRec8-B1/TaRec8-D1 (Additional file 1: Figure S4). These amino acid polymorphisms structurally differentiate these three Rec8 cohesion proteins from each other, and might lead to functional differentiation of the homoeologous proteins as meiotic cohesin in polyploid wheat. 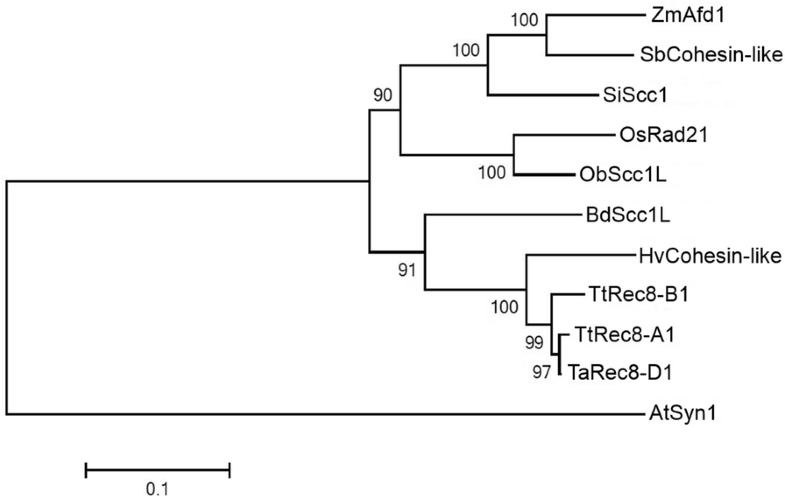 A phylogenetic tree was constructed from the predicted protein sequences of the wheat Rec8 homoeoalleles and their orthologues in other plants, indicating that TtRec8-A1 and TaRec8-D1 were more closely related to each other than their relationship with TtRec8-B1. The Rec8-like cohesion proteins from barely and Brachypodium were clustered with the wheat Rec8 homoeoalleles, demonstrating a close relationship of the Rec8-like cohesins in wheat, barley, and Brachypodium. The Rec8-like cohesion proteins from maize, sorghum, foxtail millet, Japonica-type rice, and wild rice were clustered into another group related to the wheat-barley-Brachypodium cluster. The Syn1 protein from the dicotyledon Arabidopsis was further distinct from the cohesion proteins in the monocotyledons (Fig. 7). The real-time PCR with the cDNA primers (GM010F/GM010R) shared by the three wheat Rec8 homoeoalleles (TtRec8-A1, TtRec8-B1, and TaRec8-D1) (Fig. 8 and Additional file 1: Figure S3) revealed the highest transcription level in LDN 1D(1B) (TtRec8-A1 + TaRec8-D1), followed by LDN (TtRec8-A1 + TtRec8-B1) and LDN 1D(1A) (TtRec8-B1 + TaRec8-D1). TtRec8-A1 showed the highest transcription level among these three Rec8 homoeoalleles in tetraploid wheat (Fig. 1C). Similar transcription profiles were observed with the Rec8 homoeoalleles in the hybrids of LDN, LDN 1D(1A), and LDN 1D(1B) with Ae. tauschii (Fig. 1c). Therefore, the homoeoalleles TtRec8-A1, TtRec8-B1, and TaRec8-D1 expressed differentially in the tetraploid wheat background. The CDS of the three wheat Rec8 homoeoalleles have extremely high similarity (97–99%). They differed from each other only at single nucleotide positions. No indel was detected in their CDS (Additional file 1: Figure S3). To further characterize the expression of these three Rec8 homoeoalleles in polyploid wheat, we examined their relative levels of transcription using the new SNP-based semi-thermal asymmetric reverse PCR (STARP) technique . A group of three allele-specific (AS) primers, including two allele-specific forward primers and one common reverse primer for each of the two single nucleotide polymorphism (SNP) loci targeted (GM157F1/GM157F2/GM157R and GM178F1/GM178F2/GM178R), were designed according to the contextual sequences of the SNPs (Fig. 8; Additional file 1: Figure S3, Table S1). Each of the SNPs is located within an exon of the homoeoalleles, with no intron in the region spanned by the STARP primer sets. Thus, the same amplicons were obtained for each of the primer sets in the genomic DNA and cDNA of the homoeoalleles. Prior to the transcript amplification, the STARP primer sets were tested for primer specificity and amplification efficiency in the genomic DNA of tetraploid wheat LDN, the substitution lines LDN 1D(1A) and LDN 1D(1B), T. urartu (wheat A genome donor), and Ae. tauschii (wheat D genome donor). As shown in Fig. 9a (top), GM157F1 is specific for TtRec8-A1, TaRec8-D1, TuRec8-A1, and AetRec8-D1, while GM157F2 is specific for TtRec8-B1. For the primer set GM178F1/F2/R, GM178F1 is specific for TtRec8-A1 and TuRec8-A1, while GM178F2 is specific for TtRec8-B1, TaRec8-D1, and AetRec8-D1 (Fig. 9a, bottom). These two STARP primer sets amplified a transcript similar to that of TtRec8-A1 from T. urartu (TuRec8-A1) and the one similar to that of TaRec8-D1 from Ae. tauschii (AetRec8-D1) (Fig. 9a). The pairwise amplification tests indicated that the STARP primer sets equally amplified the homoeoallele pairs in the genomic DNAs of LDN, LDN 1D(1A), and LDN 1D(1B) at different PCR cycles (Fig. 9b). Therefore, these two STARP primer sets were suitable for differentially examining the transcripts of the individual Rec8 homoeoalleles in LDN wheat background. The primer set GM157F1/F2/R discriminated TtRec8-B1 from TtRec8-A1 and TaRec8-D1 in LDN and LDN 1D(1A), respectively (Fig. 9c, top & middle), while GM178F1/F2/R discriminated TtRec8-A1 from TaRec8-D1 in LDN 1D(1B) (Fig. 9c, bottom). Both TtRec8-A1. and TaRec8-D1 showed significantly higher expression levels than TtRec8-B1 in the anthers at interphase (I) and pachytene (P) stages (Fig. 9c, top & middle). The expression levels of TtRec8-A1 and TaRec8-D1 seemed to be comparable at both meiotic stages (Fig. 9c, bottom). Therefore, TtRec8-A1 is probably the primary gene for Rec8 cohesin production in tetraploid wheat. TtRec8-B1 might also contribute to Rec8 cohesin production, but should not be significant. When chromosome 1A of tetraploid wheat LDN was replaced by chromosome 1D of hexaploid wheat CS, TaRec8-D1 expressed at a significantly higher level than TtRec8-B1 (Fig. 9c, middle). Apparently, TtRec8-B1 intrinsically expressed at a lower level than other Rec8 homoeoalleles of wheat. In addition, we examined expression of the Rec8 homoeoalleles in the hybrids of LDN, LDN 1D(1A), and LDN 1D(1B) with Ae. tauschii. TtRec8-B1 still showed the lowest expression level in the hybrids as observed in their tetraploid wheat parents (Fig. 9c and d). Therefore, the Rec8 homoeoalleles on chromosome 1A and 1D were transcriptionally more active than the one on chromosome 1B in tetraploid wheat and its hybrids with Ae. tauschii, and probably in hexaploid wheat as well. Also, we found that the presence of the Ae. tauschii D genome harboring AetRec8-D1 in the hybrids did not seem to increase overall expression of the chromosome 1D-specific Rec8 alleles (Fig. 9d). To further characterize expression of the wheat Rec8 homoeoalleles, we examined Rec8 cohesin on meiotic chromosomes in the specially constructed genotypes with different homoeoallelic combinations of the wheat Rec8 gene by in situ immunolocalization. Rec8 cohesin appeared to be evenly distributed on the individual chromosomes at early prophase I in the LDN × Ae. tauschii hybrid (TtRec8-A1 + TtRec8-B1 + AetRec8-D1), LDN haploid (TtRec8-A1 + TtRec8-B1), LDN 1D(1A) (TtRec8-B1 + TaRec8-D1), LDN 1D(1A) × Ae. tauschii hybrid (TtRec8-B1 + TaRec8-D1 + AetRec8-D1), LDN 1D(1B) (TtRec8-A1 + TaRec8-D1), and LDN 1D(1B) × Ae. tauschii hybrid (TtRec8-A1 + TaRec8-D1 + AetRec8-D1) (Fig. 10). We did not observe significant quantitative variation of unbound Rec8 protein in the cytoplasm/nucleus among the genotypes. Each of these genotypes contained one or more actively-transcribed Rec8 homoeoalleles (TtRec8-A1, TaRec8-D1, and AetRec8-D1). The presence of extra actively-transcribed Rec8 homoeoalleles did not noticeably increase the amount of Rec8 cohesin on the individual chromosomes (Fig. 10c and e). A genotype or mutant that contains only one of the homoeoalleles (TtRec8-A1, TtRec8-B1, TaRec8-A1, TaRec8-B1, and TaRec8-D1) is not available in wheat. Thus, we were unable to assess the role of a single homoeoallele in Rec8 cohesin production in wheat. As indicated in the differential transcriptional analysis of the Rec8 homoeoalleles, the contribution of the Rec8 homoeoallele on chromosome 1B to Rec8 cohesin production might be minimal, if there is any, in polyploid wheat. The actively-transcribed Rec8 homoeoalleles on chromosomes 1A and 1D may be the primary genes for Rec8 cohesin production in polyploid wheat. The Rec8-like cohesin functions as a meiotic cohesion protein in a very conserved manner from lower to higher eukaryotes [5–7]. We took this advantage to clone the Rec8-like genes in polyploid wheat through a comparative genomics approach. This work could not be accomplished by map-based cloning due to the lack of an alternative allele for the Rec8-like genes in wheat. Knockout or mutation of the Rec8-like genes leads to abnormal meiosis and sterility [12–16]. In addition, the complexity of the meiotic genetic network and difficulties in phenotyping individual meiotic events would cause extra encumbrance for map-based cloning of the meiotic genes. In the present study, we successfully cloned the Rec8-like homologues in tetraploid wheat by referencing the Rec8-like genes in model species, indicating the efficacy of this comparative genomics approach in cloning conserved meiotic genes especially from the species with a large and complex genome. 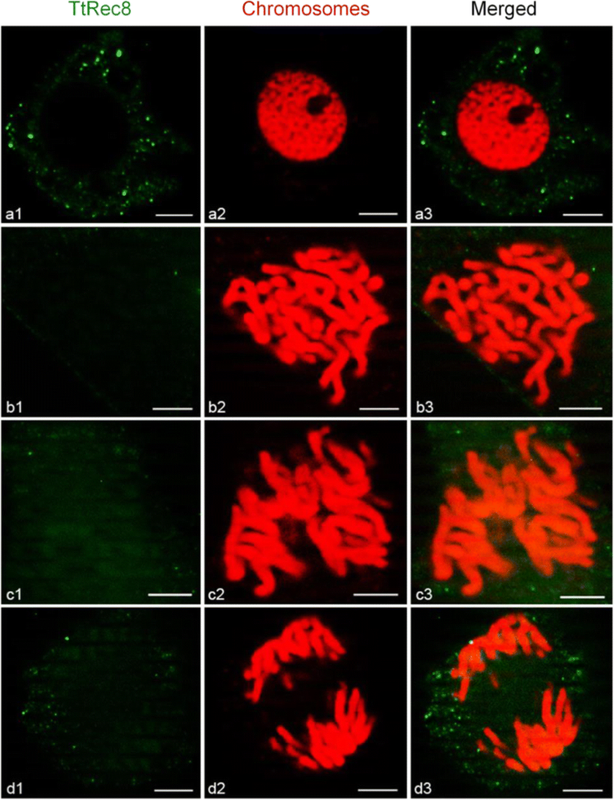 TtRec8 cohesin was detected on the meiotic chromosomes of wheat till pachynema at prophase I, but not after that by in situ immunolocalization. However, we detected lowered levels of TtRec8 protein in the anthers after early prophase I by Western blotting, indicating partial retaining of TtRec8 protein at later meiotic stages. Most likely, the retained TtRec8 protein was associated with the centromeric regions of meiotic chromosomes at later stages as observed in model species [9, 11]. But, the retained TtRec8 cohesin was not imperceptible by in situ immunolocalization due probably to the condensed chromosomal structure after early prophase I [5, 14, 34]. Wheat is an allopolyploid with two (tetraploid wheat) or three (hexaploid wheat) homoeologous subgenomes. A gene generally has two homoeoalleles in tetraploid wheat and three in hexaploid wheat [23–27, 35]. The homoeoalleles of a gene in polyploid wheat generally share high levels of similarity in DNA sequence and function, making gene cloning and functional analysis a challenging task [23, 27]. In this study, we recovered and cloned the cDNA of the homoeoallele TtRec8-A1, but not TtRec8-B1 from tetraploid wheat in the initial RACE-based cloning experiments. This might result from the lower expression level of TtRec8-B1 than TtRec8-A1 in tetraploid wheat. The use of LDN 1D(1A) substitution line, where chromosome 1A containing TtRec8-A1 was replaced by chromosome 1D, enhanced the abundance of TtRec8-B1 transcripts in the cloning pool. In addition, this substitution line introduced the homoeoallele TaRec8-D1 on chromosome 1D of hexaploid wheat into the transcript pool for cloning. Both TtRec8-B1 and TaRec8-D1 were successfully recovered and cloned from this engineered transcript pool. Apparently, this is an effective approach to clone a gene with low transcript abundance, especially in the polyploids with multiple similar homoeoalleles for the gene. The Rec8-like homoeoalleles in the A, B, and D subgenomes of polyploid wheat are highly conserved in CDS and splicing patterns. However, there are substantial differences in their intronic regions. Interestingly, we found that the Rec8 homoalleles in the wheat subgenome B (i.e. TtRec8-B1 and TaRec8-B1) had a higher DNA sequence variation than those in the subgenomes A (i.e. TtRec8-A1 and TaRec8-A1) and D (i.e. TaRec8-D1 and AetRec8-D1), especially in the intronic regions. Wheat genome mapping also identified a similar differentiation of these three subgenomes in genetic diversity [36–39]. The distinction of the wheat B subgenome from the A and D subgenomes in genetic variation may imply a different origin and evolutionary route for the B subgenome. The Rec8 homoeoalleles we cloned in this study (TtRec8-A1, TtRec8-B1, and TaRec8-D1) differ from each other only at single nucleotide positions in CDS. It was a big challenge to perform differential expression analysis of the highly similar homoeoalleles under a polyploid condition. To confront the challenge, we partitioned the Rec8 homoeoalleles in pairs using the cytogenetic stocks LDN 1D(1A) (TtRec8-B1 and TaRec8-D1) and LDN 1D(1B) (TtRec8-A1 and TaRec8-D1), and then differentially examined the relative expression levels of the individual pair of the Rec8 homoeoalleles using the newly developed SNP-based PCR technique STARP . This integrative cytogenetic and genomic approach enabled us to perform pairwise differential expression analysis of the highly similar Rec8 homoeoalleles under a polyploid condition. We found that both TtRec8-A1 and TaRec8-D1 expressed comparably at a significantly higher level than TtRec8-B1 in tetraploid wheat and its hybrids with Ae. tauschii as well. Apparently, the Rec8 homoeoalleles on chromosomes 1A and 1D expressed dominantly over the one on chromosome 1B in tetraploid wheat, and probably in hexaploid wheat as well. Concurrent presence of two or three actively-transcribed homoeoalleles (TtRec8-A1, TaRec8-D1, and AetRec8-D1) in LDN 1D(1B) and its hybrids with Ae. tauschii did not lead to a noticeable additive effect on Rec8 cohesin production. It seems that either of the two actively-transcribed homoeoalleles (TtRec8-A1 and TaRec8-D1) could independently encode enough Rec8 cohesin essential for normal meiosis in polyploid wheat. These new findings on the cross-genome coordination of the Rec8 homoeologous genes in polyploid wheat will facilitate further studies of the homoeologous genes in wheat and other polyploids. The predicted proteins of TtRec8-A1, TtRec8-B1, and TaRec8-D1 differ from each other at 23 amino acid positions. These amino acid differences separate TtRec8-B1 from TtRec8-A1/TaRec8-D1, and TtRec8-A1 from TtRec8-B1/TaRec8-D1, suggesting the uniqueness of TtRec8-B1 and TtRec8-A1 in polyploid wheat. The protein sequence-based phylogenetic analysis indicates that TtRec8-A1 and TaRec8-D1 are more closely related than their relationship with TtRec8-B1. The protein sequence differences among the Rec8 homoeoalleles might affect their activity as Rec8 cohesin, and consequently lead to a dominant expression of TtRec8-A1/TaRec8-D1 over TtRec8-B1 in polyploid wheat. The differential expression pattern and structural variation of the Rec8 homoeoalleles might be an evolutionary consequence of the allopolyploid genome in wheat . T. urartu (2n = 2× = 14, AA) contributed the A genome to tetraploid wheat (2n = 4× = 28, AABB) by hybridizing to the B genome ancestor that remains unknown . Ae. tauschii (2n = 2× = 14, DD) contributed the D genome to hexaploid wheat by hybridizing to tetraploid wheat [41, 42]. Our results and the previous reports consistently indicate that the B genome of tetraploid and hexaploid wheat have significantly higher genetic diversity than the A and D genomes [36–39]. It appears that the wheat B genome had undergone a more divergent evolutionary process than the A and D genomes . In other words, the integrity of the A and D genomes have been well maintained over the evolutionary process, but not quite well for the B genome. Therefore, the homoeoalleles in the A and D genomes may play a more significant role than those in the B genome, especially for the genes critical in plant development and reproduction, such as Rec8. This work revealed a unique cross-genome differentiation and coordination of the Rec8 homoeologous genes in polyploid wheat, indicating evolutionary dominance of the homoeologous genes on chromosomes 1A and 1D over the one on chromosome 1B for Rec8 cohesin production in wheat. These new findings imply a distinct origin and evolutionary route of the wheat B subgenome, which ancestor remains unknown, from the A and D subgenomes. In addition, this work will enhance understanding of the meiotic network in polyploids, and facilitate genome and evolutionary studies of wheat and its relatives. Tetraploid wheat ‘Langdon’ (LDN), LDN D-genome disomic substitution lines (LDN DS) , and hexaploid wheat ‘Chinese Spring’ (CS) were obtained from USDA-ARS (Fargo, ND, USA). The CS nulli-tetrasomic lines were supplied by the Wheat Genetics Resource Center at Kansas State University (KSU), Kansas, USA. All these wheat accessions were used in the cloning and functional analysis of wheat Rec8-like genes. The diploid ancestors of the wheat A genome [T. urartu (PI 428213)] and D genome [Aegilops tauschii (RL5286)], obtained from the Wheat Genetics Resource Center at KSU, were included in the expression analysis. The hybrids of LDN, LDN 1D(1A), and LDN 1D(1B) with Ae. tauschii RL5286 and LDN haploid were produced following the procedure of Cai et al. (2010) . Total genomic DNA of the plant materials was extracted from leaf tissues as described by Faris et al. (2000) . Meiotically staged male meiocytes (anthers) were sampled following the procedure of Cai (1994) . Total RNA was extracted from leaves, roots, and meiotically staged anthers using RNAqueous®-4PCR Kit (Life Technologies, Grand Island, NY, USA). cDNAs were synthesized from purified total RNA using SuperScript III First-Strand Synthesis System (Invitrogen Corporation, Carlsbad, CA, USA). The amino acid sequence of rice Rad21/Rec8-like protein (GenBank accession NP_001056426.1) was used as query for tBLASTn search against the wheat expressed sequence tags (ESTs) database . Gene-specific primers, designed from the candidate ESTs with Primer3 , were used to synthesize the candidate cDNAs from the total RNA pool. The candidate cDNAs were subsequently extended by 3′- and 5’-RACE (rapid amplification of cDNA ends). The final complete cDNA sequence of the candidate gene was amplified by the primer pair GM067F/GM065R (Additional file 1: Table S1) that spans the start and stop codons of the gene, and cloned as described by Ma et al. (2006) . The gene-specific primer pair GM008F/GM008R (Additional file 1: Table S1) was used to amplify the gene-specific genomic segments in the 21 CS nulli-tetrasomic lines and 14 LDN DS for chromosomal localization of the Rec8-like genes. The amplicons were visualized by cleaved amplified polymorphic sequence (CAPS) with the restriction enzyme DdeI on the denaturing polyacrylamide gel . Real-time RT PCR was performed with the Rec8-like gene specific primer pair GM010F/GM010R (Additional file 1: Table S1) in two technical and three biological replications using a 7300 Real-Time PCR System (Applied Biosystems, Foster City, CA, USA) . The minimum number of highly synchronized anthers (4–10) at each meiotic stage were sampled for RNA extraction. The 18S rRNA gene-specific primer pair GM003/GM004 (Additional file 1: Table S1) was selected to amplify the endogenous control for the quantitative PCR. The comparative CT method was used to determine the transcript levels of the Rec8-like gene in different samples (test) relative to the anthers at interphase stage (control) . Fold difference in gene expression of test vs. control sample is 2-ΔΔCT, where ΔΔCT = ΔCT,test - ΔCT,control. ΔCT,test is the CT value of the test sample normalized to the endogenous reference gene, and ΔCT,control is the CT value of the control normalized to the same endogenous reference gene. The CT value of each sample is the average of two technical replicates. CT values from three biological replicates were averaged, and data of the anther samples at interphase were used as baseline expression (control). The transcripts of wheat Rec8 homoeoalleles were differentially analyzed by semi-thermal asymmetric reverse PCR (STARP) [33, 53]. STARP converts single nucleotide polymorphisms (SNPs) into length polymorphisms by adding an oligonucleotide (5’-ACGAC-3′ or 5’-ATGAC-3′) to the 5′ end of the allele-specific primer. Three primers, including two-tailed allele specific forward primers (AS-primers F1 and F2) and one common reverse primer, were used to amplify the SNP alleles (Additional file 1: Table S1). Amplicons were visualized using an IR2 4300 DNA Analyzer (Li-Cor, Lincoln, NE, USA). A 464-bp cDNA segment of the Rec8-like gene in LDN was used to raise antibody against the wheat Rec8-like cohesion protein. The cDNA segment was PCR-amplified using the primer pair GM026F/GM026R. A restriction enzyme recognition site for EcoRI and SalI was added to the 5′ ends of the forward and reverse primer, respectively, for cloning purpose. Three nucleotides (TCA) were added to the 3′ end of the SalI recognition site within GM026R to generate a stop codon (TGA) in the expression constructs (Additional file 1: Table S1). The amplicon was cloned into two expression plasmid vectors pGEX-4 T-1 (Amersham Biosciences, Piscataway, NJ, USA) and pMAL-c2X (New England Biolabs, Ipswich, MA, USA), leading to two distinct constructs (pGEX-R26 and pMAL-R26). After verified by sequencing, these two constructs were transformed into E. coli strain BL21-Star (DE3) (Invitrogen Corporation, Grand Island, NY, USA) for fusion protein induction as described by Chao et al. (2007) . Upon IPTG (isopropyl β-D-1-thiogalactopyranoside) induction, the fusion polypeptides, pGEX-R26 and pMAL-R26, were accumulated as insoluble pellets and resolubilized after sonication. The total proteins were separated by the sodium dodecyl sulfate polyacrylamide gel electrophoresis (SDS-PAGE) and the candidate bands were cut out as per the estimated molecular weight. Upon the verification with a protein identification test performed in the Vincent Coates Foundation Mass Spectrometry Laboratory at Stanford University (Stanford, CA, USA) (Additional file 1: Figure S5), the polypeptide pGEX-R26 was used for immunization and generation of the polyclonal antibody in rabbits by Affinity BioReagents (Thermo Fisher Scientific, Inc.). The affinity-purified pMAL-R26 polypeptide was first coupled to AminoLink coupling resin using the AminoLink Plus Immobilization Kit (Pierce Biotechnology, Rockford, IL, USA) and then incubated with the crude serum. After incubation, the mixture of crude serum and resin was loaded to the column for antibody isolation. The anti-Rec8 antibody was eluted with the IgG Elution Buffer (Pierce Biotechnology, Rockford, IL, USA) after washing the column with 20 column volumes of 1× Phosphate Buffered Saline. Aliquots of anti-Rec8 antibody were stored in the − 80 °C freezer for subsequent uses. Protein extraction, immunoprecipitation, and Western blotting were performed following the procedures of Chao et al. (2007) . About 400 mg anthers at each meiotic stage were sampled for protein extraction in the Western blotting analysis. 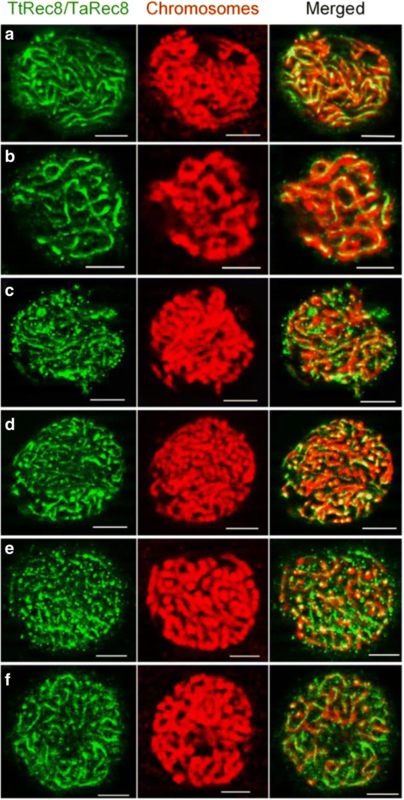 In situ immunolocalization was conducted as described by Golubovskaya et al. (2006) . The primary anti-Rec8 antibody was probed by the secondary Anti-Rabbit IgG (whole molecule)-fluorescein isothiocyanate (FITC) Antibody produced in goat (Sigma-Aldrich Co., St Louis, MO, USA), and chromosomes were counterstained by propidium iodide (PI). Two negative control experiments were performed to monitor the specificity of the antibodies in meiocytes. In the first negative control, the thin layer of polyacrylamide gel containing meiocytes was directly incubated with the secondary antibody. In the second one, the thin layer of polyacrylamide gel containing meiocytes was incubated with the primary anti-Rec8 antibody that was preabsorbed with the fusion polypeptide pGEX-R26. Microscopy was conducted using a Zeiss Axioplan 2 Imaging Research Microscope equipped with ApoTome component (Carl Zeiss Light Microscopy, Jena, Germany). Two-dimensional (2-D) and three-dimensional (3-D) images were captured and analyzed using Zeiss Axio Vision 4 software as described by Cai et al. (2010) . Three cDNA fragments of the Rec8-like gene cloned in LDN were bulked as a probe to screen LDN BAC library as described by Huo et al. (2006)  (Additional file 1: Table S1). The verified BAC clones were characterized by fingerprinting with HindIII and CAPS to identify the BACs containing specific Rec8 homoeoalleles. Sub-cloning was performed to delineate the homoeoalleles into smaller genomic fragments for sequencing using the pWEB-TNC™ Cosmid Cloning Kit (Epicentre Biotechnologies, Madison, WI, USA). The full-length genomic sequences of the homoeoalleles were obtained using the DNA Walking SpeedUp™ Premix Kit II (Seegene, Inc., Gaithersburg, MD, USA). The DNA and protein sequences of the Rec8-like gene in LDN were analyzed using BLASTP 2.2.26+ in the NCBI non-redundant database . PEST motif was predicted using EPESTFIND . Other motifs were identified with Motif Scan . The gene structures of the Rec8 homoeoalleles were analyzed and visualized using Splignand GSDS 2.0 software [59, 60]. Comparative analysis was performed for the cDNA and predicted protein sequences of the Rec8 homoeoalleles (TtRec8-A1, TtRec8-B1, and TaRec8-D1) using MultiAlin and Clustal Omega, respectively [61, 62]. Comparative analysis of the Rec8-like cohesin orthologues from different species was performed using ClustalX 2.1. Bootstrap Neighbor-Joining phylogenetic tree was built with 1,000 bootstrap replications and Poisson model using MEGA 6.0 . We thank Wayne Sargent (USDA-ARS) for technical assistance to this research, and Drs. Chung-Ju Rachel Wang (Academia Sinica, Taiwan) and Wojciech Pawlowski (Cornell University) for their kind help in the immunolocalization procedure. Also, we would like to thank Dr. Rebekah Oliver for critical review of this manuscript. This research was supported by the National Science Foundation under Grant No. 0457356. Sequence data from this article can be found in the GenBank data libraries under accession numbers MG372313 - MG372315. Sequence data of the Rec8 orthologues in other species can be found in the GenBank database under the accession numbers listed in the Additional file 1: Tables S2 and S3. Other data generated and analyzed in this study are included in the supplementary information files. GM performed the major portion of this research. WZ was deeply involved in gene cloning and functional analysis. Both GM and WZ contributed to manuscript preparation. LL performed the initial RACE and other experiments for gene cloning. WSC participated in the protein analysis and antibody production. YQG screened the BAC library for gene cloning. LQ and SSX provided technical assistance to this research. XC designed and coordinated this research, analyzed the experimental data, and prepared the manuscript. All authors read and approved the final manuscript. GrainGenes wEST database. 2018. https://wheat.pw.usda.gov/wEST/blast/ Accessed 6 April 2018. IWGSC CS RefSeq v1.0 assembly sequence database. 2018. https://wheat-urgi.versailles.inra.fr/Seq-Repository/Assemblies. Accessed 6 April 2018. Hexaploid wheat transcriptome database. 2018. https://wheat.pw.usda.gov/WheatExp. Accessed 6 April 2018. Ae. tauschii reference genome sequence database. 2018. http://aegilops.wheat.ucdavis.edu/ATGSP/data.php. Accessed 6 April 2018. Primer3 software. 2018. http://frodo.wi.mit.edu/. Accessed 6 April 2018. NCBI non-redundant database. 2018. www.ncbi.nlm.nih.gov. Accessed 6 April 2018. EPESTFIND software. 2018. http://www.emboss.bioinformatics.nl/cgi-bin/emboss/epestfind. Accessed 6 April 2018. Motif Scan software. 2018. http://myhits.isb-sib.ch/cgi-bin/motif_scan. Accessed 6 April 2018. Splign software. 2018. http://www.ncbi.nlm.nih.gov/sutils/splign/splign.cgi. Accessed 6 April 2018. MultiAlin software. 2018. http://multalin.toulouse.inra.fr/multalin/. Accessed 6 April 2018. Clustal Omega software. 2018. https://www.ebi.ac.uk/Tools/msa/clustalo/. Accessed 6 April 2018.